Silver denarius, 17mm, 3.12gm, issued AD 161-175. Rome mint. Obv: FAVSTINA AVGVSTA, Bare-headed, draped bust facing right. Rev: FECVND AVGVSTAE, Fecunditas standing left between two infants and holding two others in her arms. References: Sear 5251, RIC 676, RSC 95. 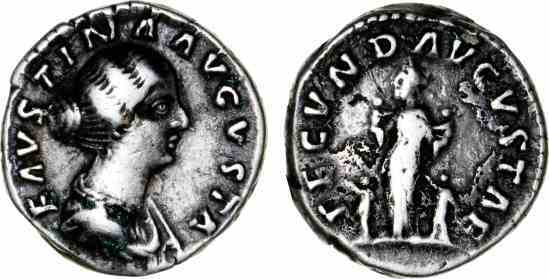 The empress Faustina the Younger proved to be very fecund, having thirteen children during her marriage to Marcus Aurelius. Only six, however, survived to adulthood.